The Idea – A location aware log book for mobile devices. One that knows where you are and enters site details for you based on your location. No internet connection required. Stage 1 – Gathering the data. Crowdsourcing the data from divers – both from companies and individual divers by providing them with a tool to make it quick and easy to contribute data about dive sites and dive facilities. A tool to gather this information has launched for iOS devices with GPS capabilities. 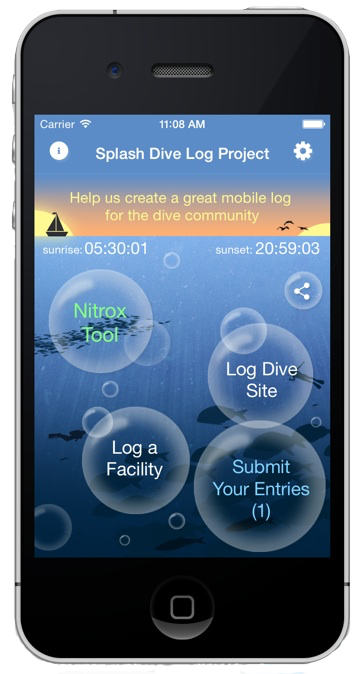 It’s called ‘Splash Dive Site Logger’ and is available on Apple’s iOS App Store today. Contributing the essential information about a dive site can take as little as half a minute. Stage 2 – The Dive Log. Splash Dive Log is in an advanced stage of development. We are looking to launch with a decent amount of location data embedded to make the app more helpful from the start. Please spread the word to all your diving friends and contacts. An app store review would also be a great help. To download the app, click here or on the app image.